Amsterdam Light Festival is a winter light festival for all ages. 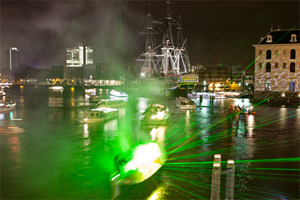 For 50 days, the historical center of Amsterdam will present a unique décor for this international light and water festival. Corresponding to the theme, ‘Building with Light’, 30 light sculptures and projections by international artists have been selected for this second edition. The boat tour, Water Colors, will exhibit artworks along, in, and above the Amstel River, while the walking route, Illuminade, will take place in the center of the city. 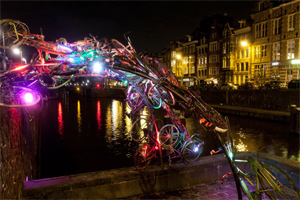 Amsterdam Light Festival will take place from Friday 6 December 2013 to Sunday 19 January 2014.